Only 99 were made in total. It will soon be the end of an era for the beloved G-Wagon, as Mercedes-Benz is gearing up to launch its belated successor with a completely new platform next year. However, the current G-Wagon isn’t quite ready to retire yet, as we’ve seen a spate of special edition models honoring its legacy. This one was by far the most extreme G-Wagon ever made: we’re talking, of course, about the monstrous Mercedes-Maybach G650 Landaulet, the open-top successor to the G63 AMG 6x6 and G500 4x4 Square that debuted at Geneva earlier this year. 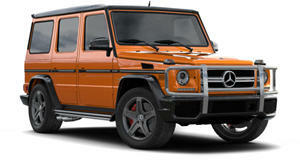 While the Mercedes brand is renowned for subtlety and refinement, those words don’t apply to the G650 Landaulet. Measuring 17.3 feet long and 7.2 feet high, with an extended wheelbase of 11.15 feet, this menacing beast is obscenely massive. It’s powerful too, boasting a AMG-powered 6.0-liter twin-turbo V12 engine delivering 621 hp and 737 lb-ft of torque. Being based on the G-Class, it’s also a very capable off-roader equipped with portal axles, locking differentials, and 450 mm of ground clearance. And yet this rugged off-roader is also surprisingly opulent, as the rear compartment was constructed by Maybach featuring the same sumptuous rear seats as the S-Class. Only 99 examples of Mercedes-Maybach G650 Landaulet were built, 98 of which have all been sold. The last ever model that rolled off the production line has been kept in possession by Mercedes, and will be sold off at the company's upcoming Zoute auction on October 6. Finished in white paint with a tan soft top, it will mark the first time a Mercedes-Maybach G650 Landaulet has ever been sold at a public auction, and all funds raised will be donated to the Laureus Sport for Good charity. Given its exclusivity, Bonhams expects the G650 Landaulet to surpass its list price of 630,000 Euros ($753,259) when it goes under the hammer next month. More power, more luxury, more glitz, and more glam.